Frithville’s Will Wright played his final match for Lincolnshire on Sunday, competing in England Hockey’s Eastern Region County Tournament at Old Laughtonians Club in London - going out on a high. The Lincolnshire under 17 team were undefeated against teams from Essex, Cambridgeshire, Hertfordshire, Suffolk and Norfolk and have not lost a match throughout this season of inter-county contests. 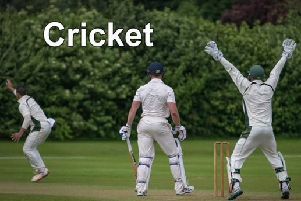 Despite playing through hail Lincolnshire had wins against Essex, Hertfordshire, Cambridgeshire and Suffolk to claim a rare victory in this annual tournament against many much larger counties. Will started his club hockey at Boston Hockey Club, and has represented Lincolnshire Hockey since age 11. “Winning today was hard work against teams of similar quality,” Will said. Will has played in two National Schools outdoor finals as well as three national indoor club and school finals, but this was the first time that Will has come away with a winners medal. Will added: “I am delighted to have played for Lincolnshire, and really grateful to the time spent by our county coaches over such a long time.